We first ventured into the streets near Pham Ngu Lao, the backpackers area, to find some decent place to exchange money but were surprised to find stores with reprints of travel guides sold at half the price. 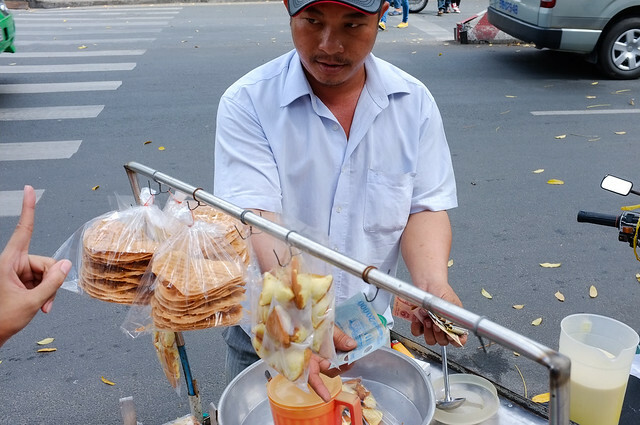 The streets in this area are lined up with establishments catering to both local and Western tastes. Different as they may be, they all had one thing in common. The restaurants had tables set outside on the sidewalk, with all the chairs facing the street. Farther into District 1, the trees became taller than the buildings, the roads were busier, and the foreigners were lesser in number. Every now and then, we would pass by groups of people sitting at a street corner drinking iced black coffee, chatting and staring right into the streets. I have a pretty good memory but it was no match for the street names in Saigon. How can you remember Cong Truong Lam Son, Nguyen Trung Truc, or Chu Manh Trinh after a single glimpse at the map? Only two names stuck with me: Pasteur, the only Western sounding street name that we walked on, and Le Loi, because it only had 2 syllables. We found all the places we have marked with an "X" in our map and our feet were more than happy to tread back home. The day ended with us sitting at a bar looking like it was plucked straight from Boracay (weird beach-y vibe), each of us with a bottle of Bia Saigon in hand. 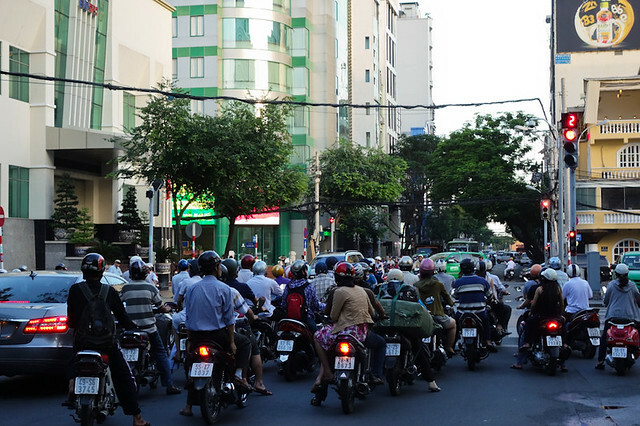 It was not a leisurely walk but it was exactly what we needed to see Saigon within a day. 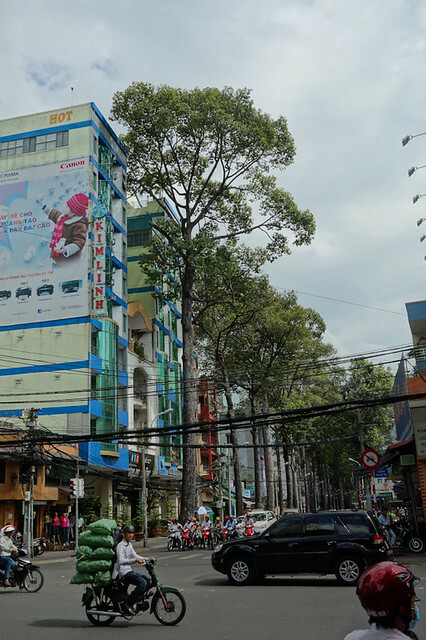 Far from the nice and efficient cities that can leave you feeling stiff, Saigon is a breather full of roaring (literally) life. The streets may not be litter-free and following the stoplight is optional, but I found the warmth and festive mood of the city more comforting than that of highly-urbanized cities. 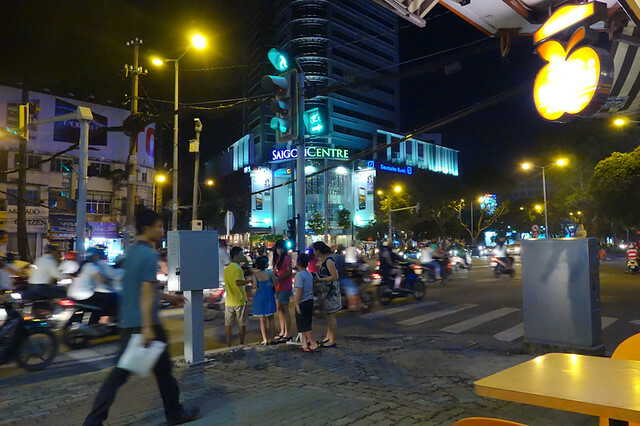 Compared to busy Hanoi in the north, I found Saigon more endearing. However tiring the day was, I drank my Bia Saigon with satisfaction. 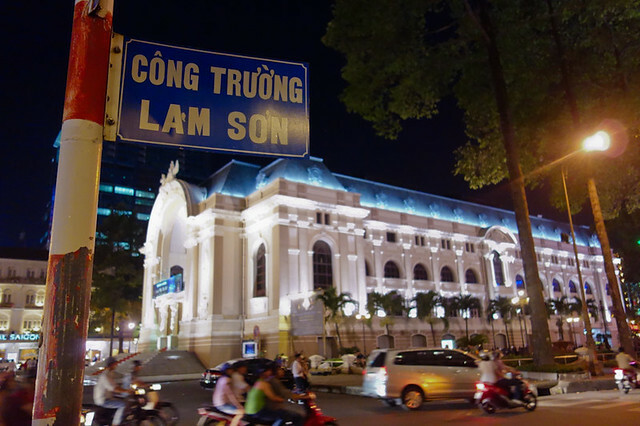 I like Saigon. Well, except for the bland food (and beer). Ask me to explain why and I would probably not come up with concrete reasons. Maybe it’s because of the motorcycles, maybe because of the parks and architecture, maybe because it’s just what it is. It’s easier to stop being rational, forget about putting reasons to words, and just say exactly what it makes me feel. Oh and about that "Will we be scammed?" game? It happened exactly at the moment this photo was taken. My sweet tooth must be blamed. Share your love for Saigon!